Well done to all the children in Class 4 and KS2 for two incredible performances of 'Mystery at Magpie Manor'! Altogether we'll make the twenties roar! 2018 is the centenary of the RAF and to coincide with commemorations in London, Class 4 spent some time learning about the history and development of the RAF over the past 100 years. This culminated in watching the impressive flypast live from London and making our own paper Spitfires, Hurricanes or Red Arrows! On Thursday 5 July, every child in every class voted to what the theme title would be for a 'space' theme in Summer 1 next year. The options were: ‘The final frontier’, ‘In a galaxy far, far away…’, ‘3,2,1 Blast Off!’, ‘To the Moon and Back’ and ‘One small step, one giant leap’. Placed on the stage, was a big ballet box and everyone made their decision and folded their vote. It was the children’s choice because they wanted their say. (No adults were allowed to vote.) What will win? On Tuesday 19 June, we travelled on a coach to Leeds Town Hall to perform in the 'Big Play' Concert. We spent the morning rehearsing and then, after lunch, we listened to the other instruments before it was our turn to play. With about one hundred other children, we played four songs: Rock Around the Clock, I'm a Believer, In the Jungle and She'll Be Coming Round the Mountain. Once we had finished, we received a huge round of applause from the audience. After that, we collected all our belongings and came back to school on the coach. It was a very tiring, but great day! On Tuesday 5 June, Class 4 visited the British Library at Boston Spa. Having walked there, we were then taken on a tour of the site including seeing the robotic cranes at work in the low oxygen building, learning about PLR (Public Lending Rights) and seeing a glimpse of the colossal amount of books which are stored there - up to 8000 new publications are added to the collection each week! We also learned about the job of a curator and saw some of the items linked to the Harry Potter: A History of Magic exhibition. After lunch, we enjoyed a talk from local author Tom Palmer. He hosted a reading quiz which culminated in a penalty shoot out that Finn won! It was a great visit and we had a super day. This half term we will be listening to and learning about the BBC's Ten Pieces, including Aaron Copeland's Hoe Down! Watch the full performance of Copland's piece by the BBC Symphony Orchestra. On Tuesday, we - along with the Year 5 children from Class 5 - adapted and followed a recipe for a picnic slice. Once we had rolled out the puff pastry, added some toppings and Carole, Fiona and Gaia had very kindly cooked them, we designed some packaging for our products. Eventually, in the afternoon sunshine, we had a picnic and tasted them - they were delicious! Our evaluations were very positive, although there would be some changes if we made them again. Hopefully you had a taste of the slices that made it home! Inspired by some of the sculptures we spotted at Harlow Carr, we have been designing and developing our ideas for plant-like sculptures made out of paper. First we practising our skills of working with paper. Then we made a prototype before finally creating our finished masterpieces - don't they look great! On Friday 11 May, Class 4 went to Harlow Carr. We had a very hands-on workshop with Jill and became plant hunters - like Carl Linneaus. We learned about the Latin names of plants and hunted for three different species of oak tree (Genus: Quercus). We also looked at the different adaptations of plants in the Alpine House before having lunch with Class 1 and then exploring the gardens - and the playgrounds in the afternoon. It was definitely worth waiting for better weather than our original planned date in March! Thank you to Mrs Scott, Mrs Ritson, Mrs McCune, Mrs Nicholls and Mrs Hill for coming with us too. In science this half term we have been learning about plants. We have started growing some as well to prove that you can grow a new plant from other parts, not just a seed. Our willow stem, runner bean seeds and potato tubers have all sprouted leaves but it is hard to tell if the leaves from the money plant have started growing roots or not. We had great fun planting these and have enjoyed watching them start to grow. 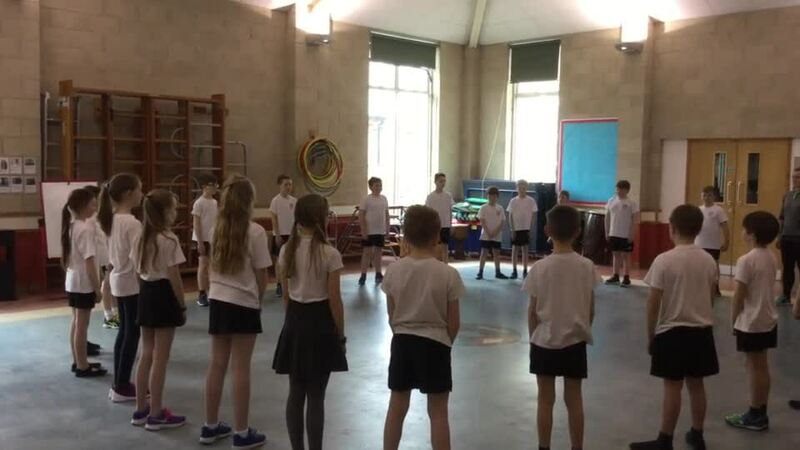 Last Wednesday, Class 4 went to Boston Spa School to take part in the annual Skipping School Competition. 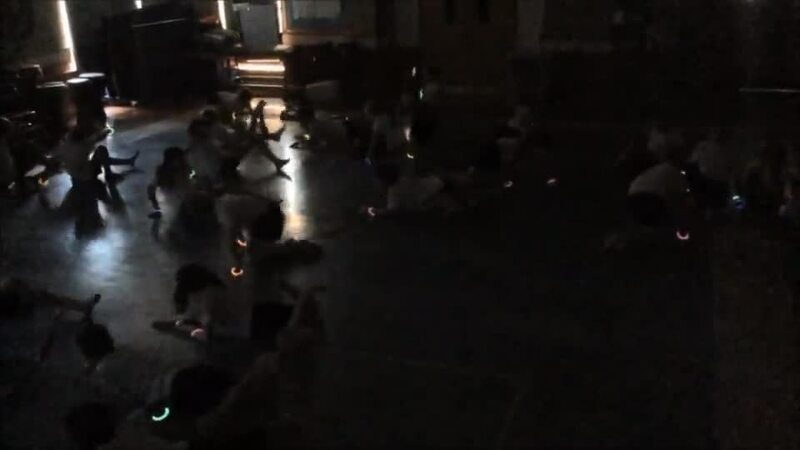 It was a great morning, jam packed with skipping! 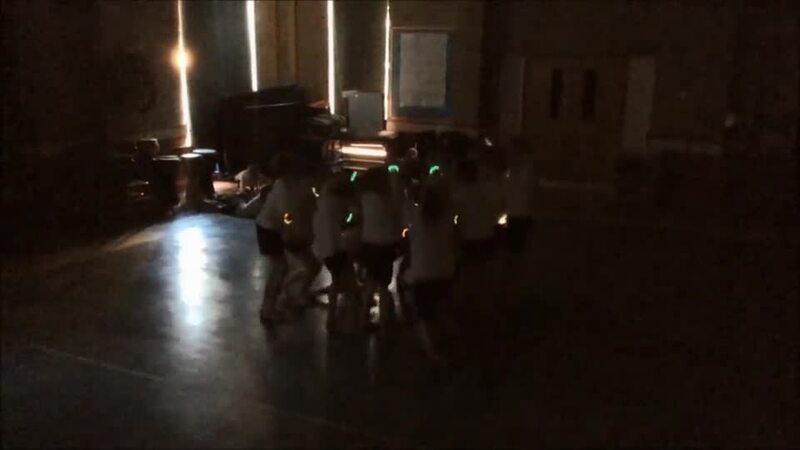 We had loads of fun and came a very respectable second overall; we won lots of awards including GOLD in the skipdance! We have a very busy half term ahead of us and we will be out and about quite a lot! We had a wonderfully successful - and sunny - afternoon at our Indoor Garden Party and raised a whopping amount of money! Thanks to everyone who helped the afternoon go so well. We had loads of fun working in our houses: playing games; creating paper flowers; selling our products; and spending our money! Our stall was bright and colourful and jam-packed with our jam jar lanterns, painted pebbles and pots and minibeast magnets - as well as the quiz. On Friday 16 March, we received a wizardly gift from Steph and the team at the British Library down the road. They have donated nine display panels from their History of Magic exhibition - copies of items in the sold out London show which is now moving to New York. Our avid Harry Potter fans (including the staff) are very excited at the prospect of having our very own Harry Potter exhibition in school - thanks Steph and everyone at the British Library at Boston Spa! We will also be thinking about the difference a garden can make - and the difference we can make to a garden too. (The wildlife garden at the bottom of the field in particular!) 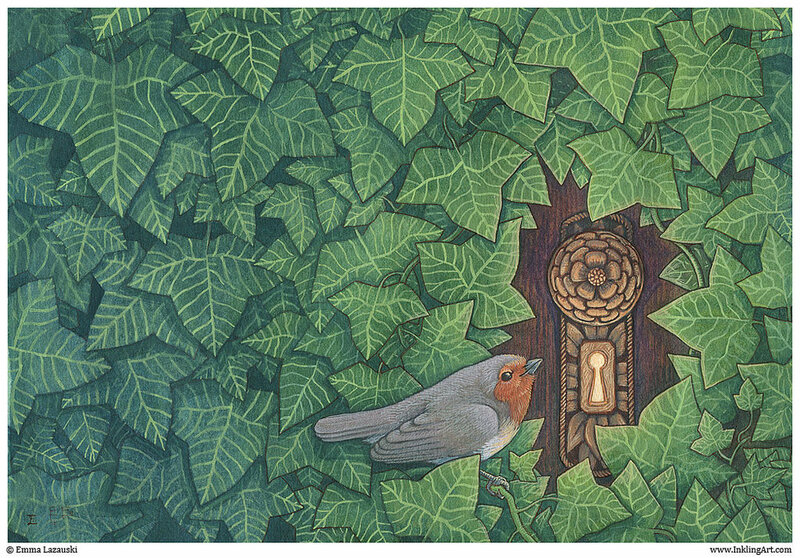 Check back here in a few weeks time to see how we hope to do this... We will be reading Frances Hodgson Burnett's classic story from 1911, The Secret Garden as well as looking at some famous poems, including William Wordsworth's I Wandered Lonely as a Cloud. Happy New Year! This half term we will be learning about different ways of connecting things and ideas. We have already been puzzling over some 'connecting walls' (from the TV Quiz Show 'Only Connect'), working on letter writing and learning about pilgrimages as a way of connecting with special places. In art, we have been creating some geometric patterns by printing with paint. We used at least two different objects to print with and at least two colours which had to overlap. Have a look at our great designs! 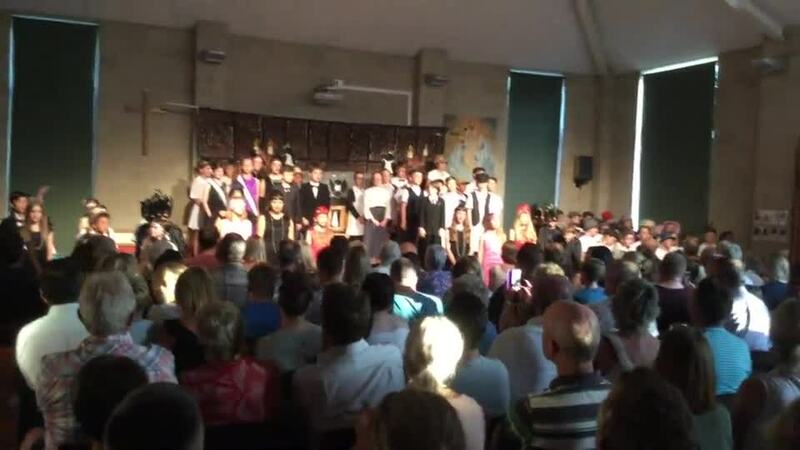 Congratulations on a fantastic class worship last week! Written by the pupils and delivered with clear voices and enthusiasm, we shared all our learning from this half term: E for En Francais, N for Navigation, O for Observing Over Time, R for Rockets, W for 'War of the Worlds', D for Dance and I for Incarnation - I WONDER! 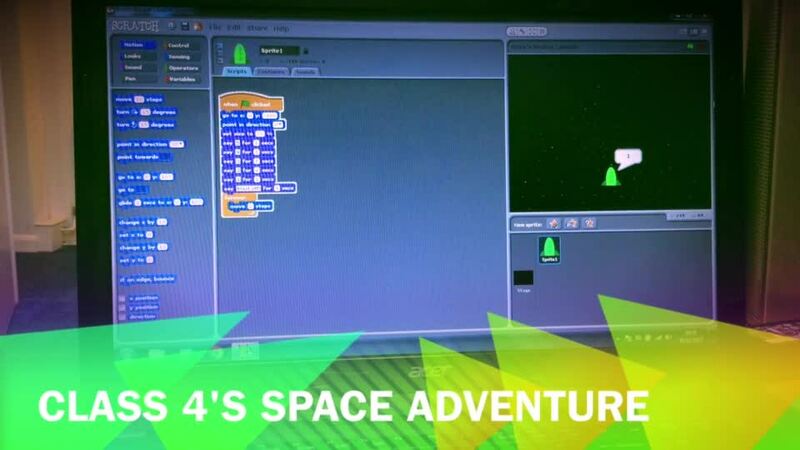 Below are a couple of videos we shared - of our coding work using Scratch and our dance inspired by the music of Jeff Wayne and HG Wells' science fiction story. On Tuesday 7 November, we had a visit from Louise and Namrah from the School of Chemistry at the University of Leeds to undertake a 'Mighty Mix Up'! We had a great morning creating mixtures, solutions and emulsions - including trying to make our own vanilla ice cream! We have started reading H.G.Wells' The War of the Worlds and we have listened to some extracts from the musical version and Orson Welles' radio broadcast. Here are some of our artworks inspired by the musical track. The chances of anything coming from Mars are a million to one he said. The chances of anything coming from Mars are a million to one, but still they come!